Shaft Seal: Teflon Barrier Seal to Protect Motor Bearings. Carbon Face Mechanical Water Seal. Buna is Standard, Viton and Teflon available. 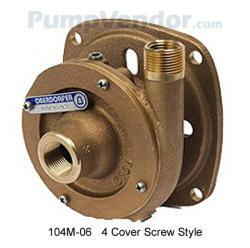 Motor / Drive: Pump heads mount to standard footed NEMA 56J jet pump motors. A wide variety of motors are available and we can assemble for you. This close-coupled pump uses a standard NEMA J-Flange Jet Pump Motor with weld-on base and threaded shaft end to accept the pump impeller. The pump uses a mechanical type shaft seal with a Buna rubber element. It is suitable for water, oils, and some mild solvents and it is limited to 212 F. Viton® seals and Teflon seals (Chemlon) are available for severe solvents, difficult chemicals, and elevated temperatures. Will Handle Contaminated Liquids. Extremely Quiet. A Standard in the Marine Air Conditioning Industry.